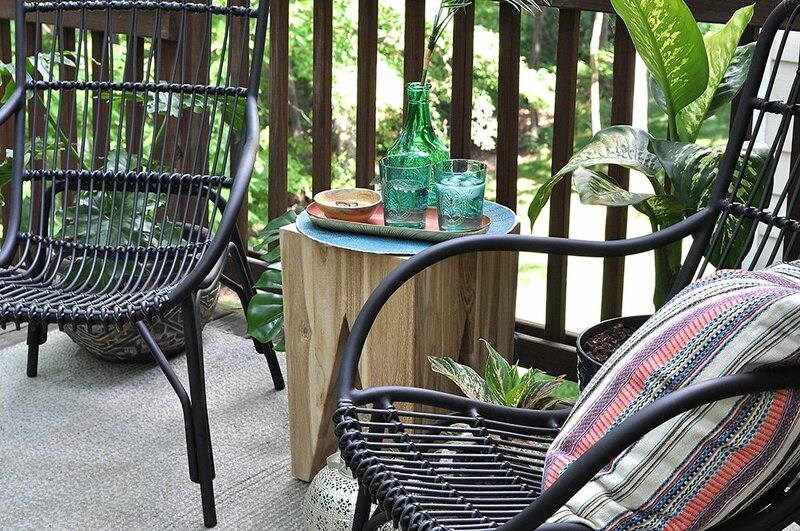 I am excited to share my updated balcony for backyard summer fun! 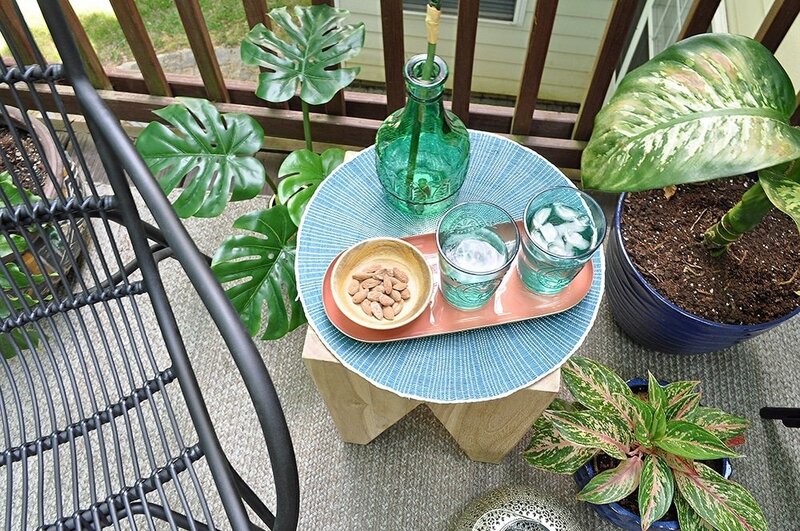 I found some of the coolest furniture pieces to create a funky boho place on my deck to entertain my friends and enjoy the outdoors. My husband and I love to hang out on our deck on the weekends. Our home has two stories in the front and three stories in the back. We have a walkout basement with an amazing lower patio, but we prefer the second story deck to entertain on. There is a heavily wooded barrier in the backyard and we can hardly see our neighbors. So being up that high makes you feel like you are in a treehouse. It’s our happy place when we are at home. Sadly our happy place has had the same furniture for some years now. We wanted a more relaxed laid back place to sit while cooking on the grill and listening to music. 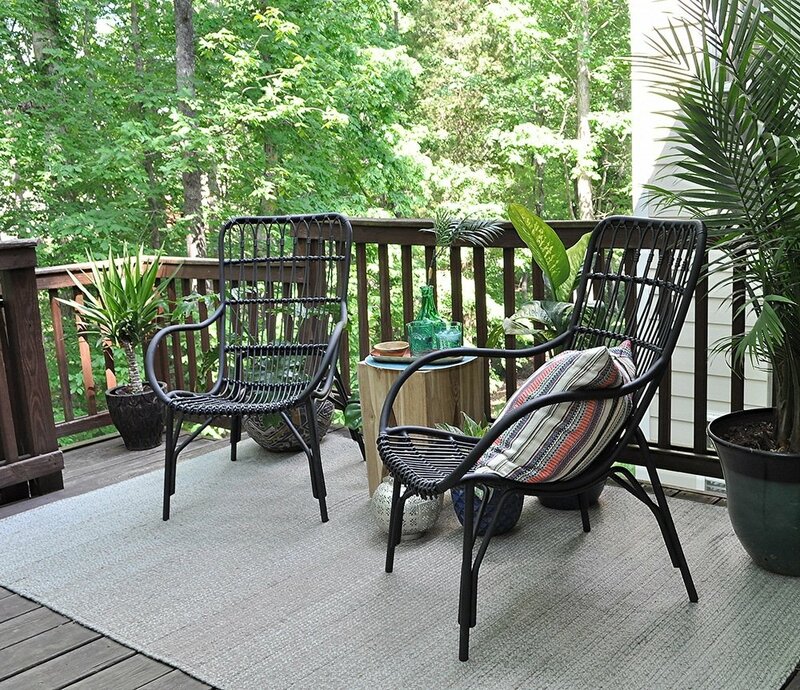 I am partnering up with my friend’s at Article to rejuvenate our outdoor space and make it more inviting. 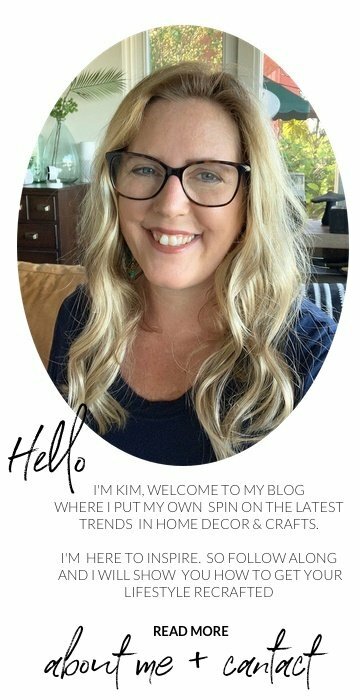 Before this makeover, I had not heard of Article furniture but after looking at their website, I fell instantly in love with the vibe of all their pieces! 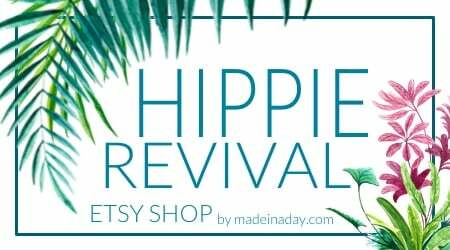 Their style is modern vintage or mid-century modern, which happens to go perfectly with the modern boho theme of my own furniture and decor. This furniture is extremely well made and the quality is top notch. 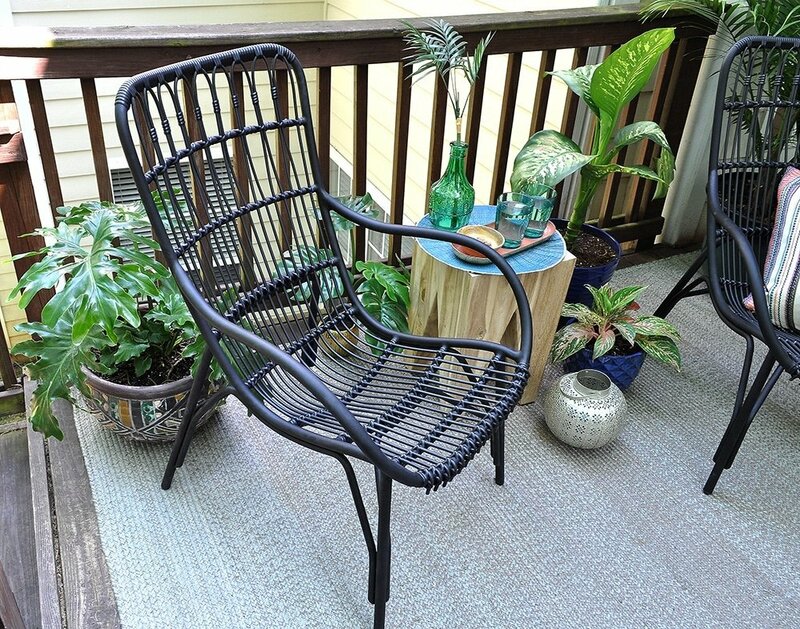 I really love the look of rattan furniture but my husband absolutely loathes it. He doesn’t like the feel of weakness or creakiness when you sit on it. 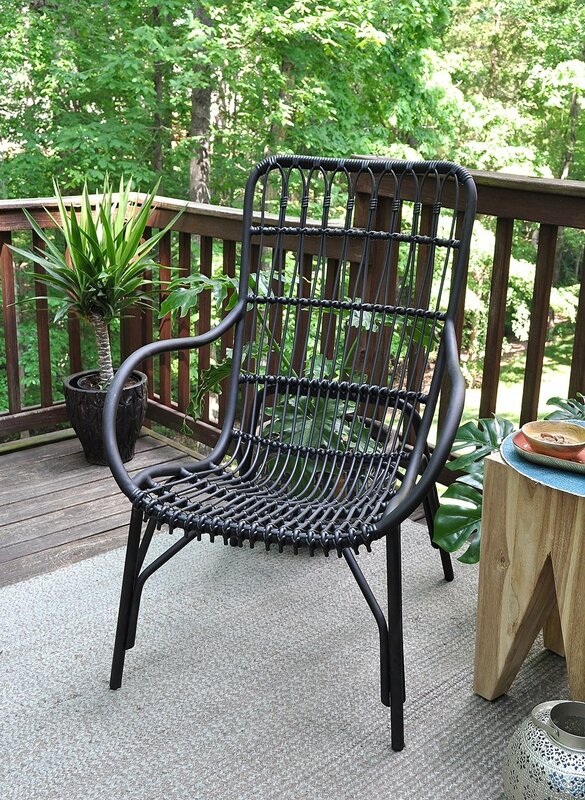 I was able to win him over to the rattan club with the stunning Medan Lounge Chair. It has the look of the 50’s & 60’s vintage wicker but it is woven with eco-friendly synthetic fiber instead of natural fiber. That means no cracking, breaking or discoloring over time. Plus they are free of heavy metals and 100% recyclable. The first night we got them the husband and I sat in them for hours. Guess what? He approved! He loved that the Medan Chair doesn’t creak when you sit on it. They feel strong, well made and very lightweight. I think they are just gorgeous and I love that smart yet funky boho feel to them. I have been looking to buy a chunky wood table and the Tana Stool is a perfect choice. This is technically called a stool, but I prefer to use it as a table for a place to hold my cocktails. 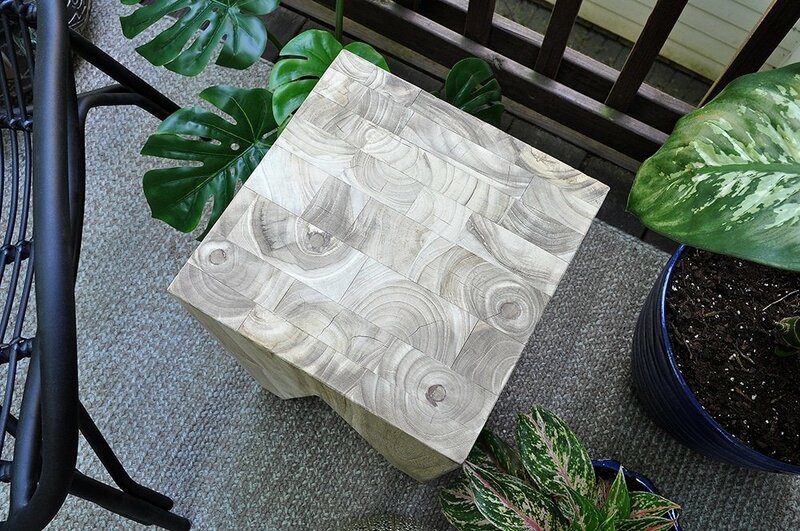 This surprisingly heavy stool is made from teakwood found in the highlands of Southeast Asia. It has such character, I love the how the feet are carved on an angle. 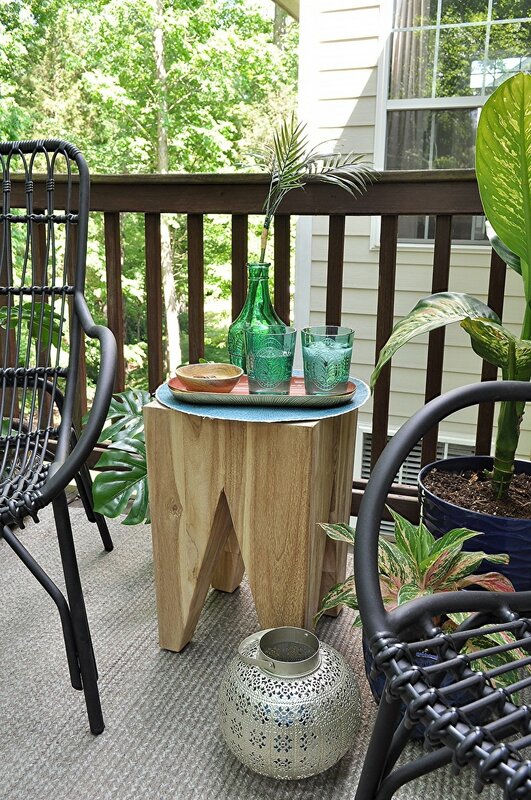 Being outside in the elements, the teak will develop a beautiful silver patina over time, and small cracks will appear inline with the wood’s natural grain. So, in other words, it will get better with age. The patterns in the wood are just mesmerizing. Love it! To tie all of these pieces together I chose the Stria Light Grey/Dark Grey Rug. It is woven with yarn made from recycled plastic bottles. How cool is that? The pattern is a light dark grey ombre and has the look and feel of wool. 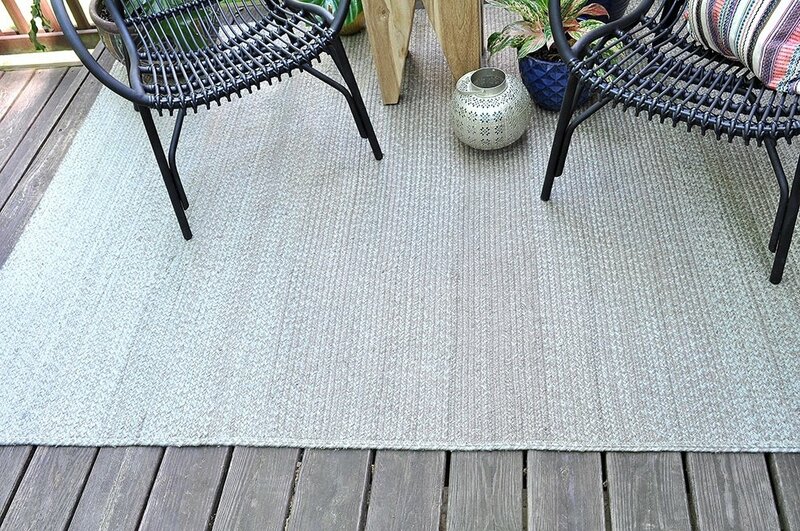 I love a good rug on a deck and this one finishes off the look of my makeover perfectly. Plus a great way to use up those pesky plastic bottles we toss out every day. All of these items came meticulously wrapped and boxed in order for them to arrive in perfect condition. Just open the box unwrap and use! It is Article’s goal to deliver original modern furniture direct to you. You get high-quality furniture at remarkably lower (that means fairer) prices than you would at a typical furniture retailer. There are no showrooms and no salespeople. Article is a super simple company to work with. Buying furniture couldn’t be easier. Just order and wait for it to arrive! I am so thrilled with my outdoor furniture selections and my new boho abode among the trees. Now on to the next! I do have my eye on one of Article’s gorgeous tan leather sofas. The Sven Charme Sofa has a worn vintage patina and natural scratches. These features make this sofa totally dog-friendly. It’s perfect for our two dog family. I just need to talk my husband into it! 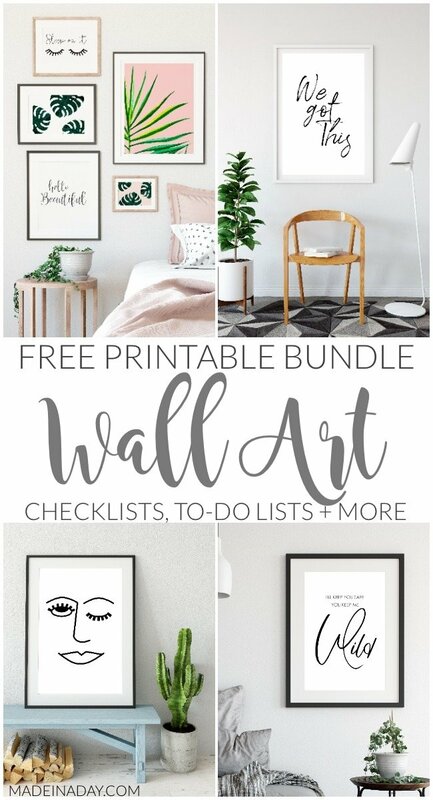 Looking to refresh your space? 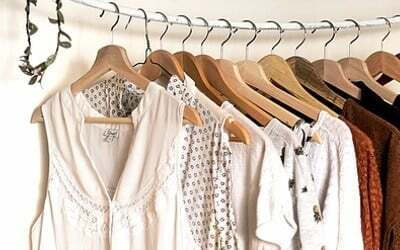 Article is having a Memorial Day Sale that starts today! Yay! Mother’s Day SALE Up to 50% Off Select Items. 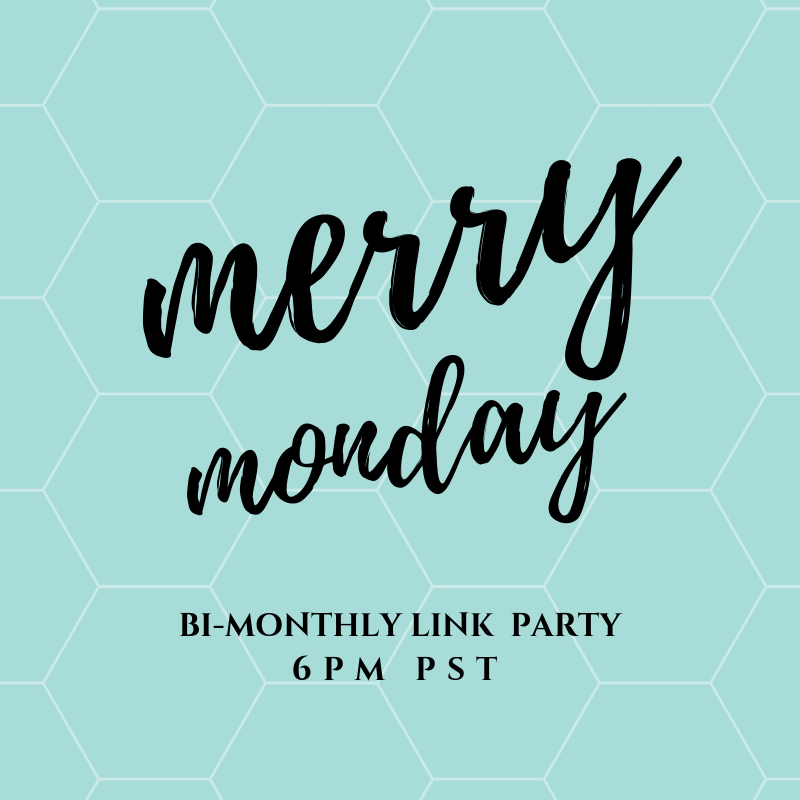 Ends May 13th, Midnight PT. 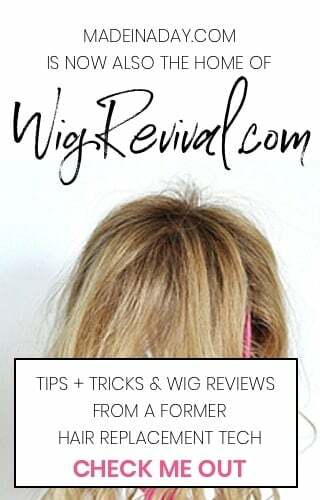 Disclosure: I am partnering with Article in this post. I received compensation, but all opinions are my own. Looks like such a lovely and relaxing spot to enjoy some Iced tea or Lemonade!! Thanks so much for stopping by and for leaving such a sweet comment!! You have a beautiful outdoor space. 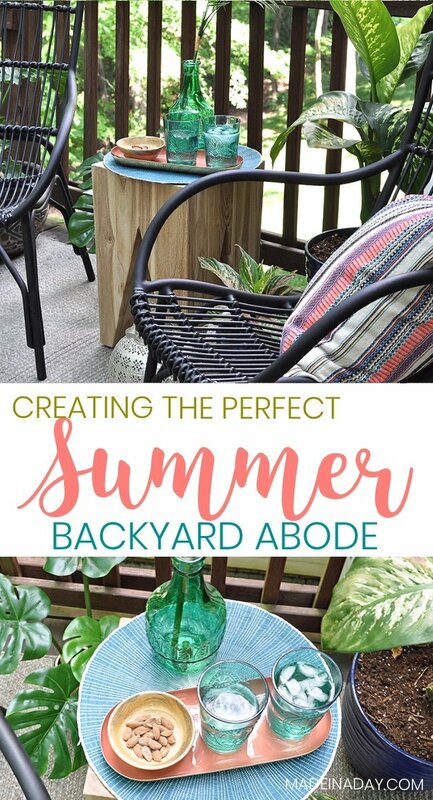 I bet you will be spending a lot of time out there this summer. I love to sit outside in the morning and drink my first cup of coffee. Sitting outside and listening to nature has a way of making me feel very peaceful. Sitting out there with coffee sounds wonderful. I may need to try that! 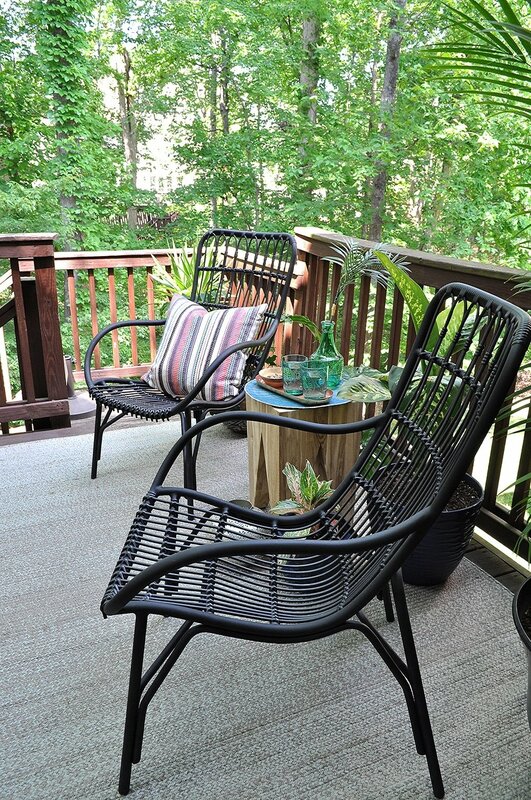 Your backyard and porches sound awesome! Love the idea of feeling like your in a treehouse. This looks comfy, cozy, and a great place to relax. The furniture & style is perfect! I love my new furniture! It is too cool. Those chairs are amazing and funky. Thanks for stopping by!